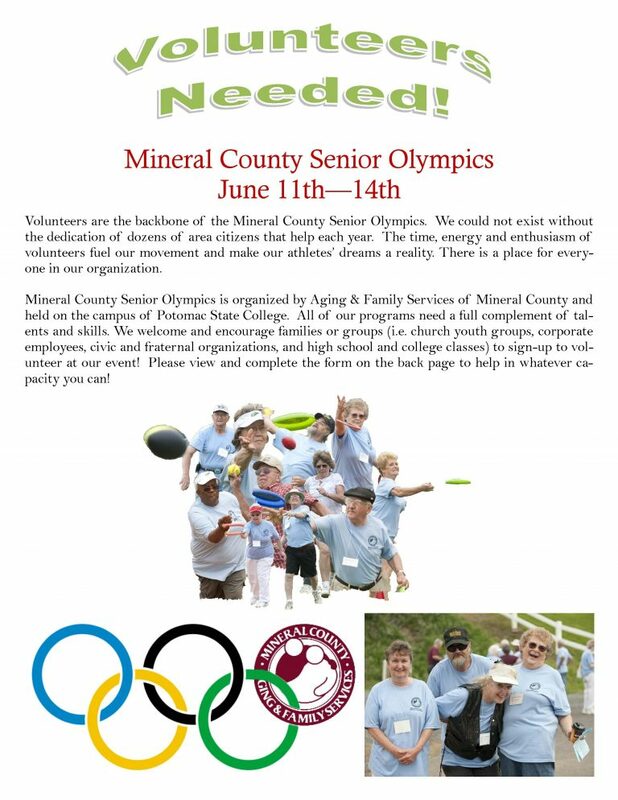 Aging & Family Services of Mineral County is excited to announce that we will be hosting the Senior Olympics from June 11th – 14th, 2019. This is our eighteenth year hosting this event. 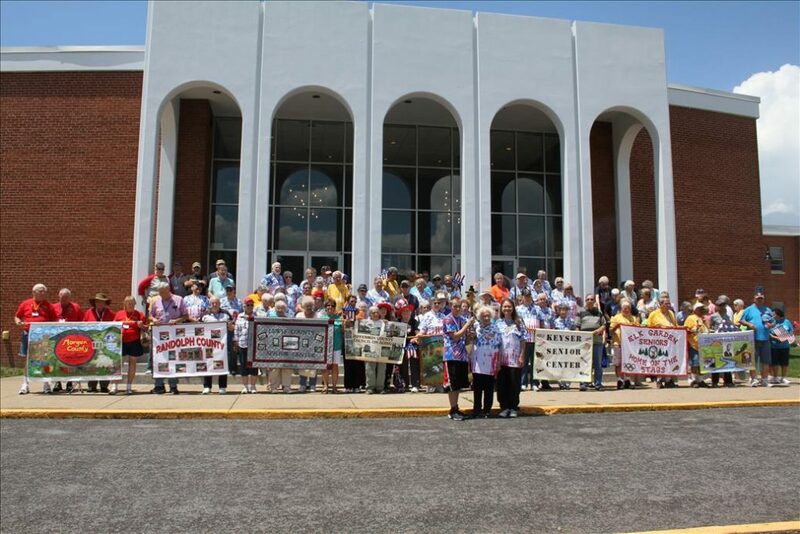 Annually, over 130 seniors from across West Virginia and surrounding states participate in a variety of competitions. The events are held at Potomac State College in Keyser and other locations within the community. 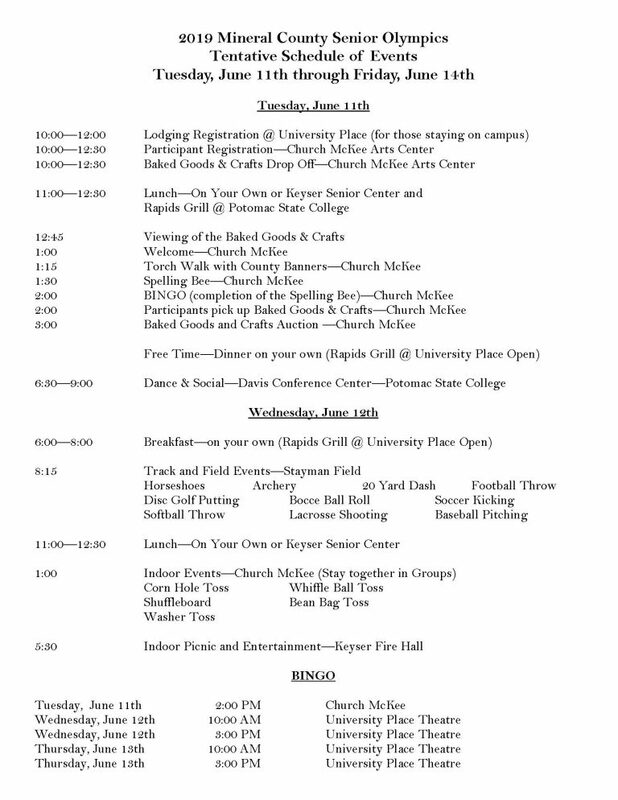 The competitions begin on Tuesday afternoon and culminate with the Awards Ceremony on Friday. 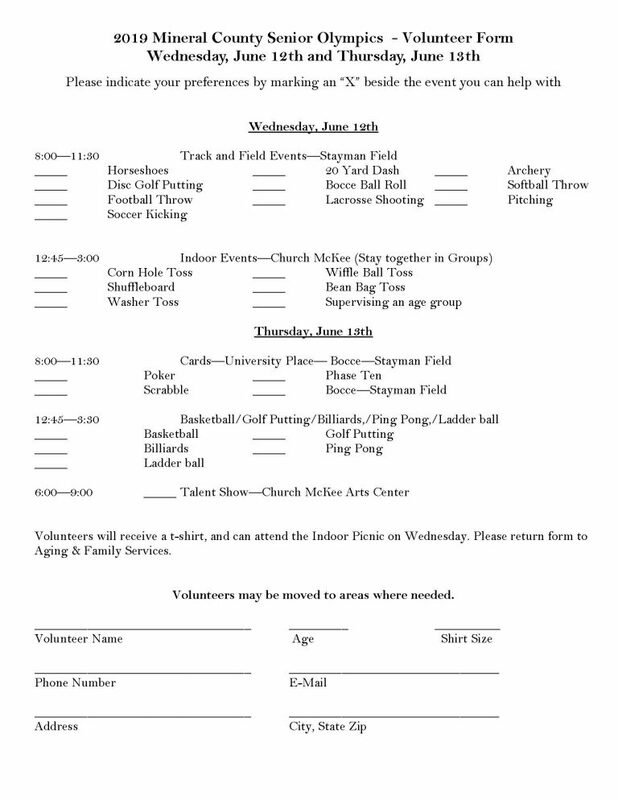 Registration will be held from 10:00 AM until 1:00 PM on Tuesday, June 11th. 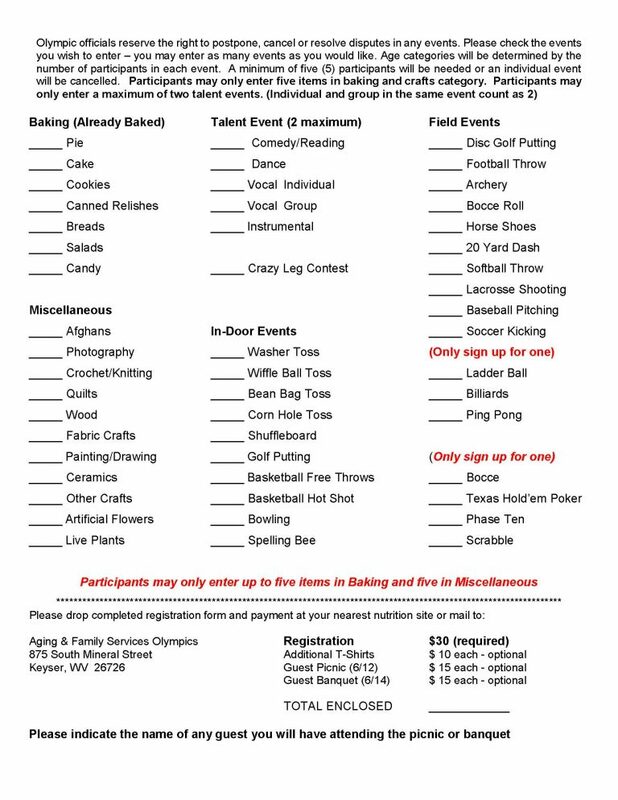 County participants can drop off their crafts and baked goods entries, before checking into their rooms or eating lunch. Lunch is not provided but is available at the Keyser Senior Center. Traveling counties may choose to eat before the arrival in Keyser. Our “kick-off” dance is held at the Davis Conference Center on the Potomac State College campus. Dinner with entertainment is scheduled for Wednesday. 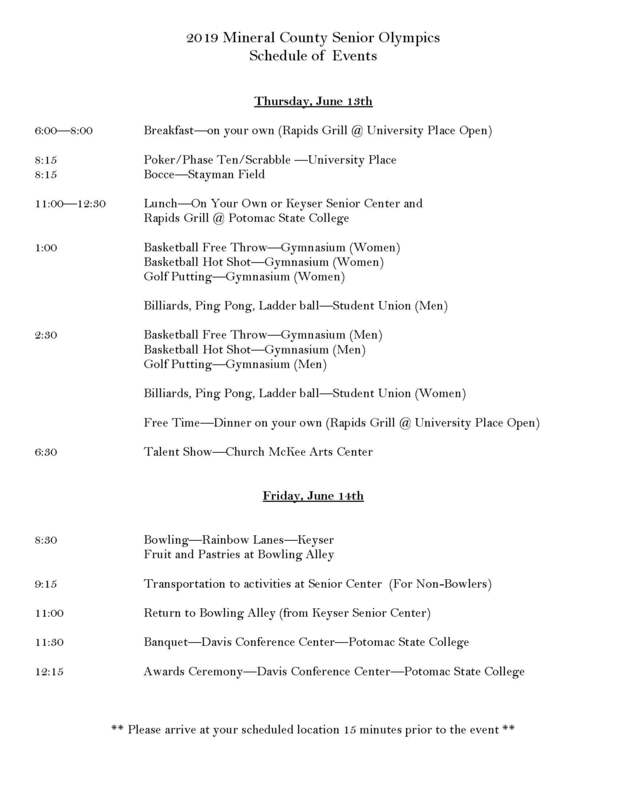 Our Banquet and Awards Ceremony will be held at the College, beginning at 11:30 AM on Friday. We award a trophy for the best County banner. Please see the banner page, so your group can start working on their Olympic banners. 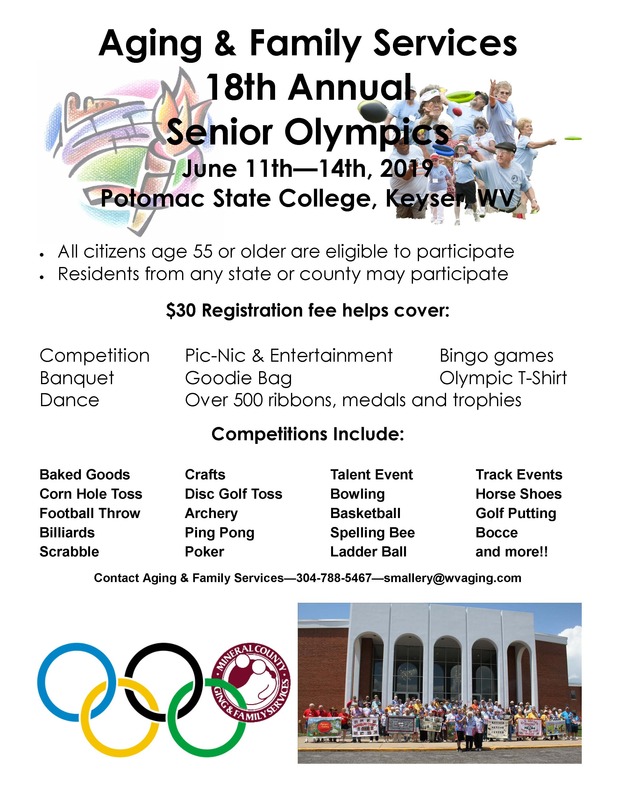 Registration for this year’s event will again be $30 for each participant. Participants will receive a T-shirt and goody bag. The cost of registration also covers the dance, picnic with live entertainment and a banquet meal for all registered participants. This registration fee will help to offset the $15,000 cost to host the Olympics. We seek donations from around our community and state to help with these expenses. Included is a donation sheet if your agency or any organizations or businesses you know would be willing to sponsor your group or an event. Lodging is available at the University Place Dormitory of Potomac State College. University Place has two types of rooms. Quad Suites are two separate rooms for a total of four individuals and a shared bathroom. Each of the rooms contains two twin-sized beds. The second room type will be a double private suite. These include two smaller rooms with one twin bed in each room and a private bathroom. Each room has a separate thermostat to control the heating and air-conditioning of that room. The private double suites are very limited. Lodging at the college includes a blanket, a fitted and a regular sheet, a pillow and pillowcase, two towels and a washcloth. Additional toiletries and linens are available at an additional cost to the participants. Beds are made before guest arrival. Housekeeping will service rooms and baths on Wednesday and Thursday. All common areas are maintained daily. Guests will receive their room key between 10:00 AM and 12:00 Noon on Tuesday, June 11th. Although, a continental breakfast is not available, the Rapids Grill (located in the dorm) will be open to purchase breakfast and coffee. Lunches during the week will be available at the Keyser Senior Center on a donation basis. Located in University Place, and available to our seniors, is a fitness center, theater, lounges, laundry room and more. Participants, using campus lodging, will be within easy distance to walk to and from events, if they’re not competing. A highlight of previous competitions has been our Thursday evening talent show. The talent show will start at 6:30. All performances will be limited to five minutes and contestants in the singing category will be limited to one song. We will again be holding a “Crazy-Legs” contest during the talent show. We need to have at least five participants in each age group, for specific events to be held. 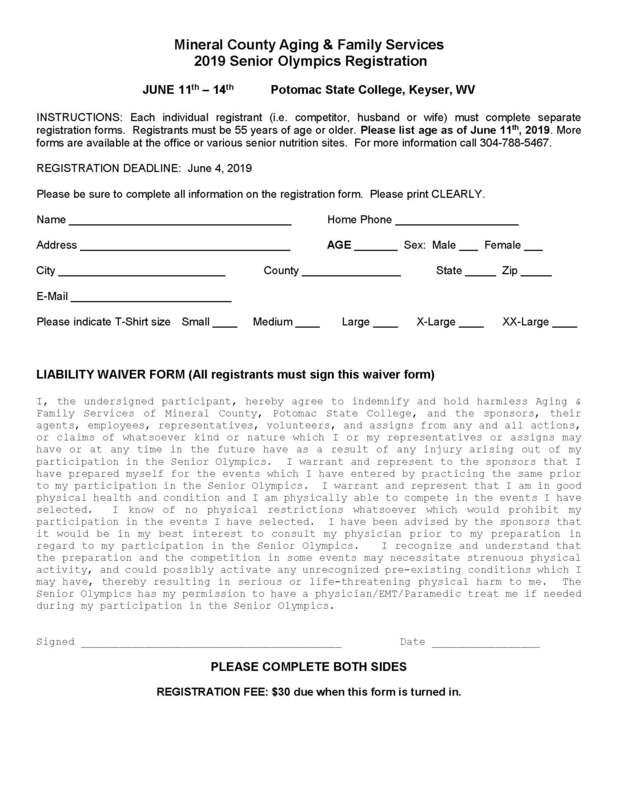 Please note that an individual must pre-register for a few events to compete in those events. However, participants may choose to compete in most events even if they did not register for them. A small craft and baked goods auction will be held on Tuesday afternoon after the items are judged. Responses from previous participants have been excellent and once you send a group, they will want to return year after year. If you or your center would like further information, please feel free to contact our agency.